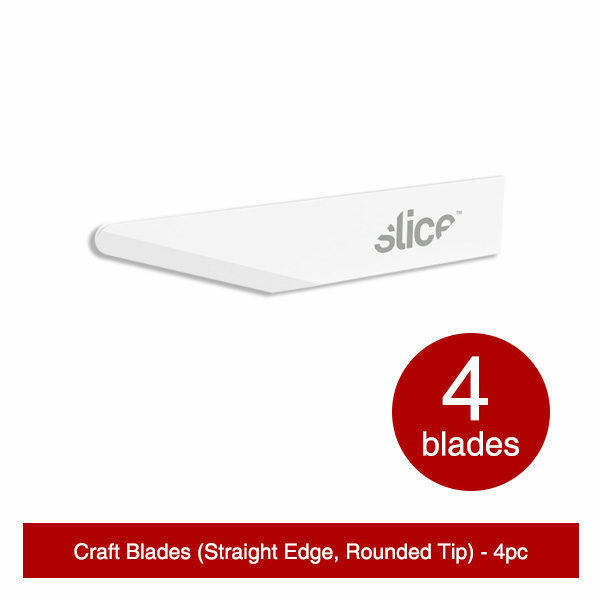 The Slice craft knife blades work with all the Slice craft handles to provide controlled, detailed cuts and a much safer finger-friendly® cutting edge. 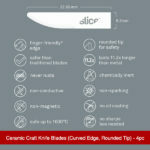 The Slice 10518 craft knife blades work with all the Slice craft handles to provide controlled, detailed cuts and a much safer finger-friendly® cutting edge. 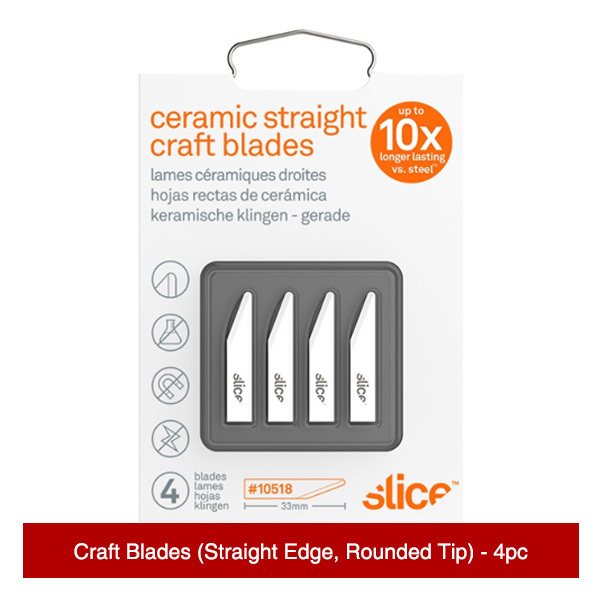 Unlike standard metal or ceramic craft blades, these straight-edge, rounded-tip blades feature a proprietary safety grind. Moreover, they hold their edge up to 11 times longer than metal, do not require a sharps disposal box, and are recyclable. 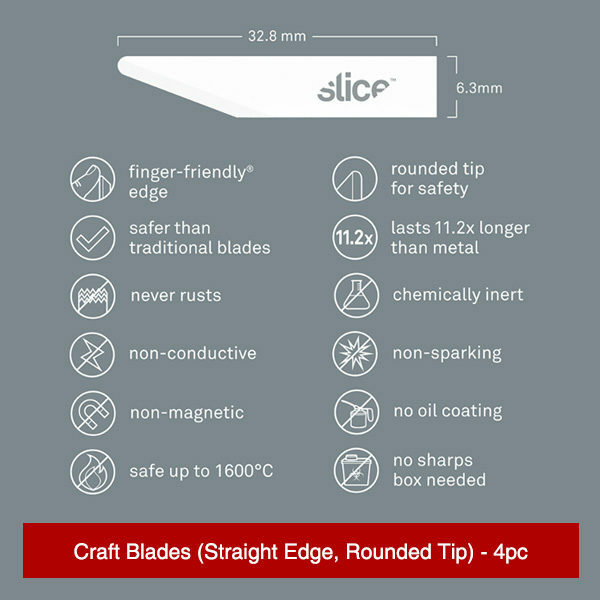 As with all Slice safety ceramics, these blades are non-sparking, non-magnetic, chemically inert, and never rust. 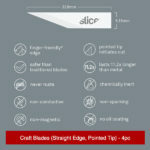 Slice® 10519 Craft Blades (Straight Edge, Pointed Tip) present another option to anyone using Slice craft tools like the Craft Knife, Precision Knife, or 10568 Scalpel. While rounded-tip blades protect against puncture injuries, some materials require a pointed tip to initiate the cut. Enter the 10519 blade, with all the same benefits as Slice’s other craft blades, including their safer finger-friendly® edge. This one-sided blade lasts up to 11 times longer than metal and is ideal for intricate, detailed cuts. 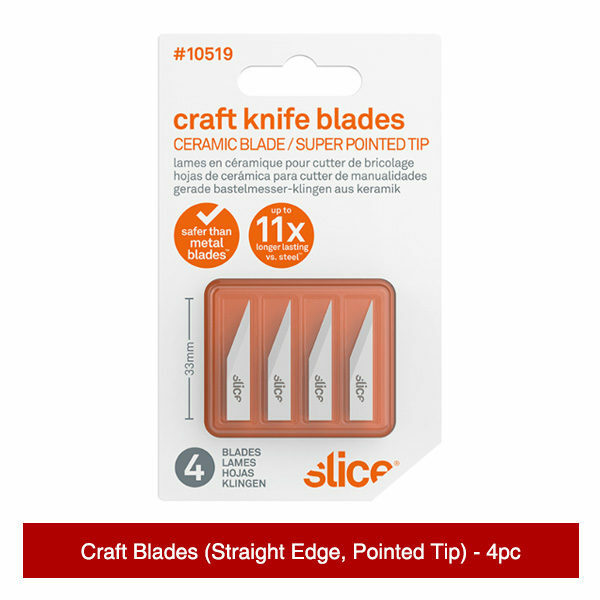 Slice 10520 craft knife blades are made of 100 percent hand-sharpened zirconium oxide. They feature a curved edge for added maneuverability and a rounded tip to guard against puncture accidents. As with all Slice ceramic safety blades, their 10520 blades are non-magnetic, chemically inert, non-sparking, and never rust. Their craft knife blades are designed for use specifically in the 10548 Craft Knife. 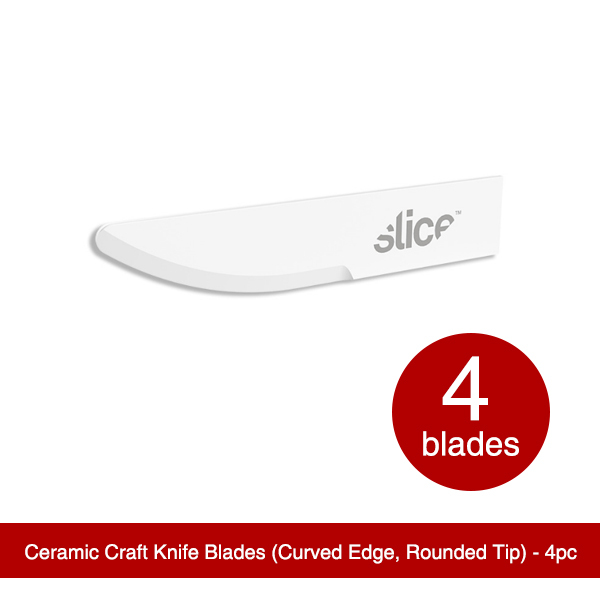 Slice replacement blades are made with 100 percent zirconium oxide, an advanced ceramic material that combines a number of useful features to set it apart from typical steel blades. Zirconium oxide is non-sparking, non-conductive, non-magnetic, chemically inert, and never rusts. Their blades are safe up to 1600 degrees Celsius and therefore ideal for sterilization and laboratory settings. Steel blade manufacturers sharpen their edges aggressively—way beyond what’s needed to cut materials—in order to compensate for the softer metal’s rapid dulling. Zirconium oxide’s natural edge retention allows for Slice’s proprietary finger-friendly® grind, which is designed to be safer to touch while maintaining its cutting performance. 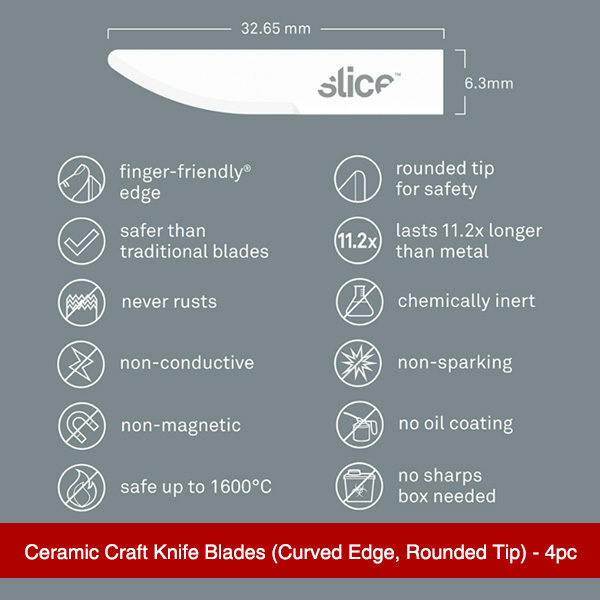 It’s important to note, though, that the safety edge is unique to Slice and doesn’t apply to other ceramic blades. 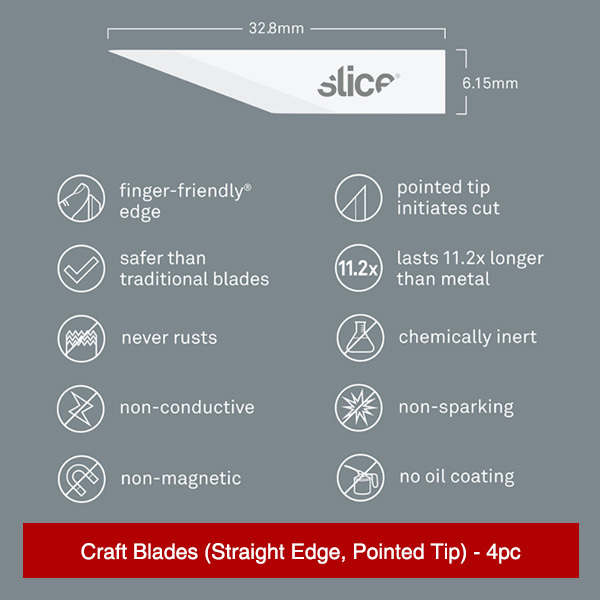 Slice’s longer lasting blades also reduce potentially dangerous blade handling, as they don’t need to be switched nearly as often as steel. 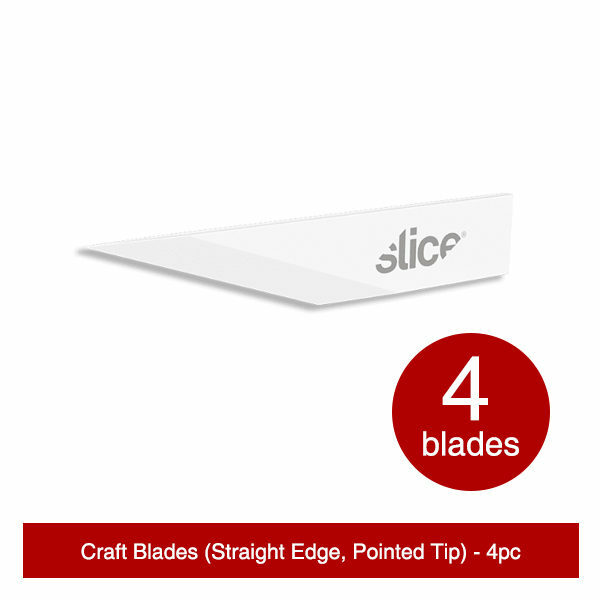 And, because of their safer edge, Slice’s recyclable blades do not require special sharps disposal boxes. The short answer is no. 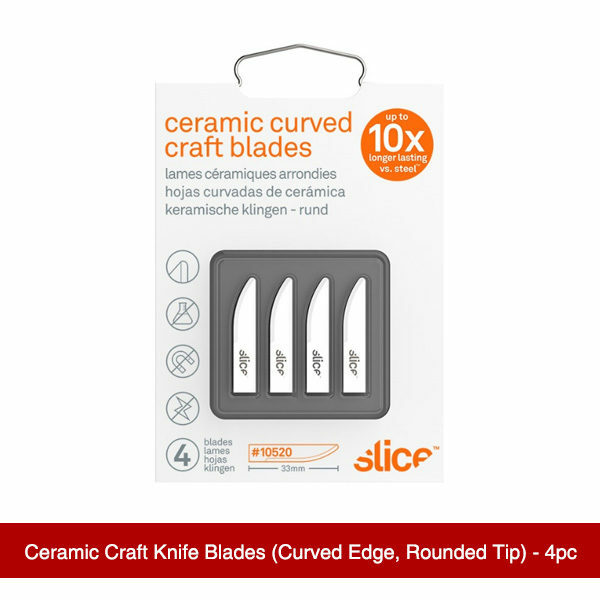 Because advanced ceramic blades are so hard, they can’t be sharpened with the same tools used to sharpen steel, which is much softer. 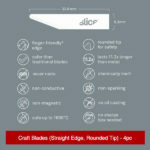 Slice ceramic blades are sharpened by hand with a proprietary grind that provides their finger-friendly edge. This patented blade design can’t be replicated outside the Slice manufacturing process. A Slice replacement blade lasts 11 times longer than steel, so the need for replacement is greatly reduced. As with any cutting tool, you need to bring out a blade replacement as soon as your edge is too dull. It’s important to reiterate that Slice blades do not start out as sharp as steel blades or ceramics from other manufacturers. In terms of safety, steel blades start out far too sharp. This is the manufacturer’s way of compensating for a soft material that dulls too quickly. Other ceramics manufacturers imitate the same grind edge as steel. Slice blades start at an effective but safe sharpness level and take 11 times longer to dull than steel. Even so, if you’ve been using your Slice box cutter for a while and you notice that it’s taking much more pressure than is reasonable to cut, it might be time to break out some new box cutter blades. The same is true for the craft blades. Cutting tools are most dangerous when they are too sharp or too dull. Slice blades are never too sharp, but after a (long) time, they will eventually dull. That’s when slipping accidents might occur, so it’s best to replace your blade then. The craft knifes are designed exclusively for use in Slice craft handles: the 10548 Craft Knife, the 10589 Craft Knife (Safety Cap), the 10568 Scalpel, and the 10580 Precision Knife. Like most of the replacement blades, the craft knife blades come with options. Choose between the Straight Edge, Rounded Tip, the Straight Edge, Pointed Tip or the Curved Edge, Rounded Tip. To change our finger-friendly replacement blades, just pull the old blade out and slide the new one into your craft knife.